It already seems ages ago that I visited the Great British Sewing Bee Live event – although, in reality, it’s not that may weeks! 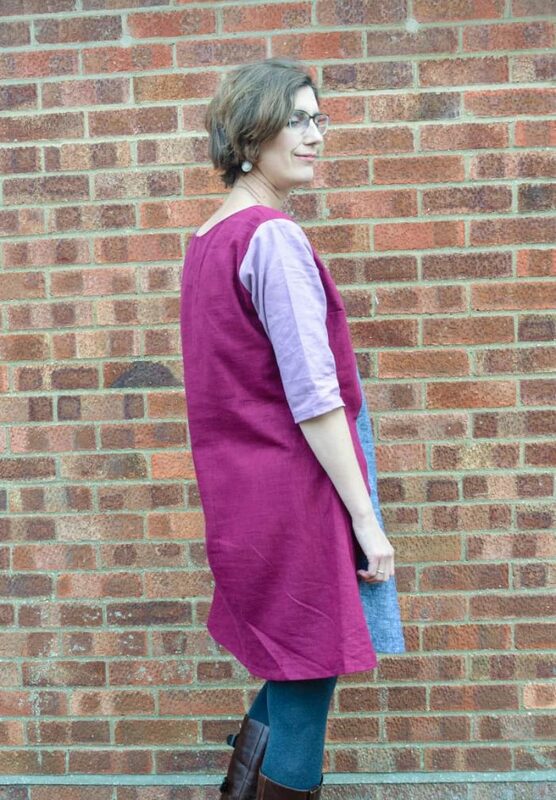 I wore my denim dress for the occasion, meeting Laura of Sew Different she kindly gifted the colourblock dress pattern. 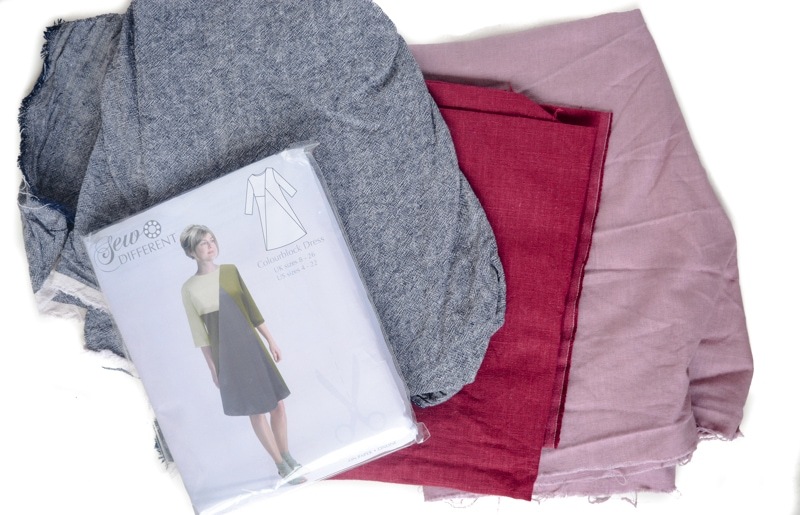 During the day I had fun choosing fabrics to sew it up with, eventually settling on three linens (not a recommended fabric on the back of the pattern!). I have to admit choosing fabrics proved tricky, in the end, some lovely ladies who I met on the coach going to the event helped me, thank you ladies. Last week, with a planned trip to the Knitting and Stitching Show in Harrogate I decided to make up the dress. The plan to wear it to the show. 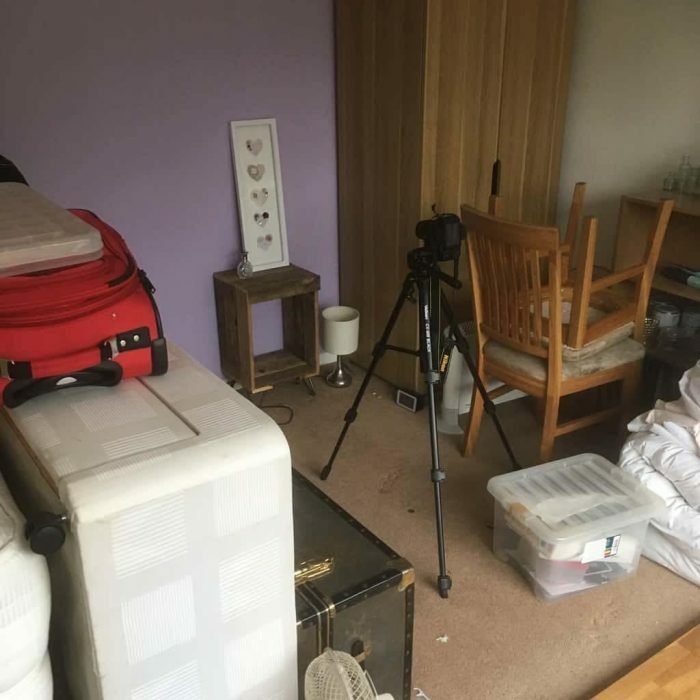 My real priority for the Tuesday was to finish an article for Reloved magazine, edit images and send the images over (amidst packing!) 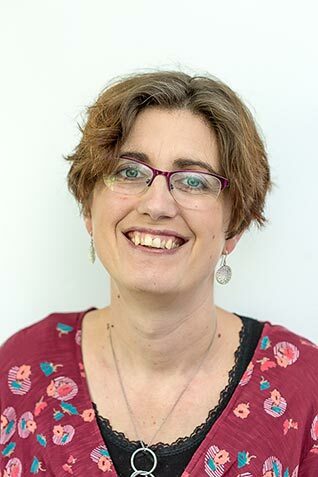 – not selfish dressmaking. One of the aspects of Sew Different patterns I love is the ease of making. The dress has no zips or buttons, perfect for those of us who are slightly nervous about inserting zips into clothes. An extra bonus as this saves so much time. I made this dress in less than three hours including cutting out. 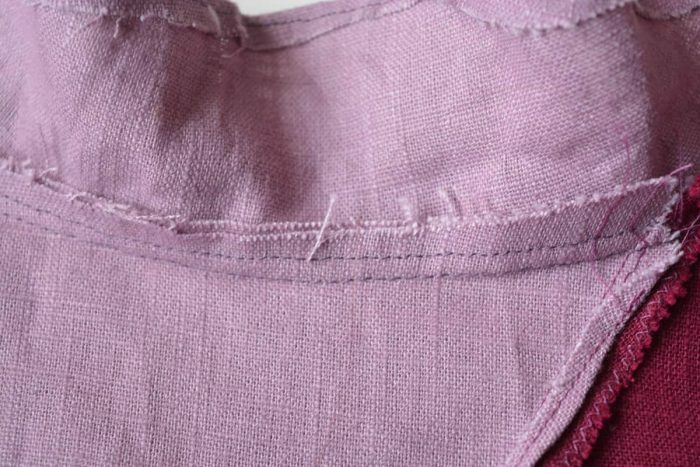 The linen fabrics sewed up beautifully – I did change methods of finishing seams part way through. Initially, I started with turn and stitch method then swapped to zigzagging the raw edges. Personally, I prefer the turn and stitch finish but for some unknown reason I stitched the dress with a 1 cm seam allowance making this a little tricky. I have no idea why the pattern clearly states 1.5cm. As a result, the neckline is a little wide, I won’t be making that mistake again! Did you ever watch the Great British Sewing Bee? Watching this I learnt the value of understitching around the neckline. 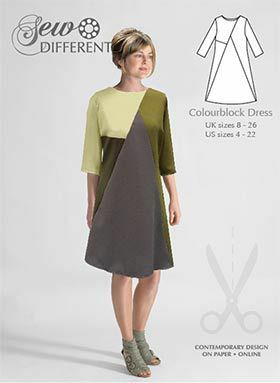 This is advised on the pattern, it makes such a difference to how flat the finished neckline lies. I am delighted with the finished dress – the fabrics hang together well. The V point is really easy, just follow the instructions. The only downside of using linen is that it creases so easily. 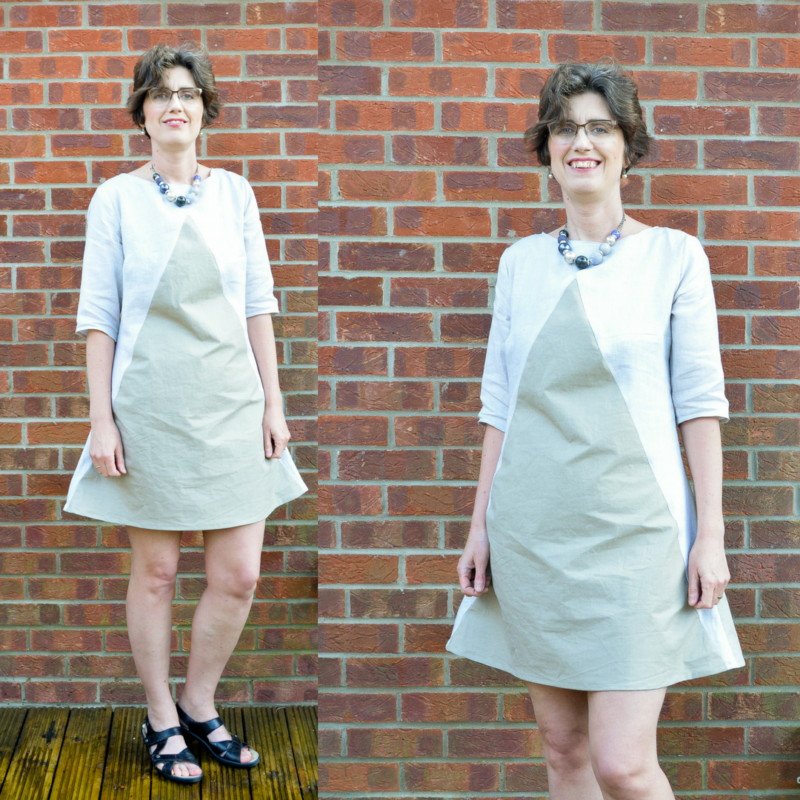 Since writing this post I have made the dress a second time with the correct seam allowance – this time for my Mum. 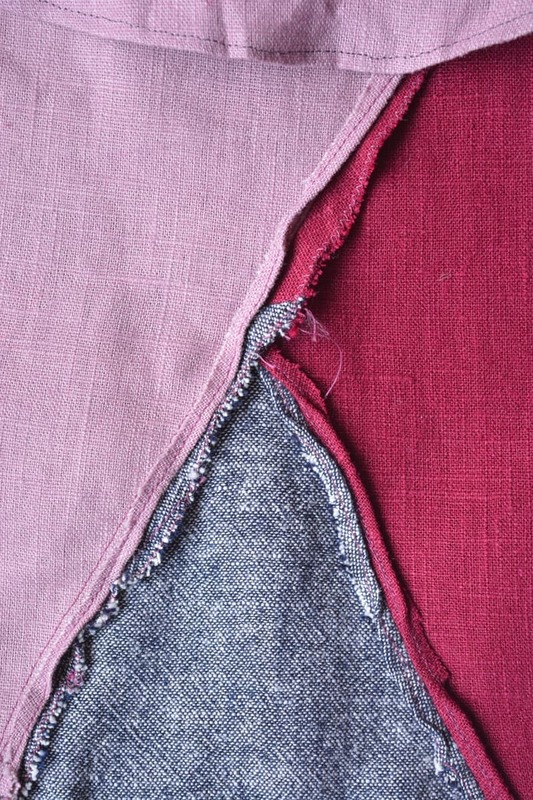 The lighter fabric is a lightweight linen, the slightly darker also feels like linen but has an almost wax finish to it. Thankfully she chose the heavier weight fabric for the central panel and the back so it hangs well. "Seeking Inspiration – Knitting & Stitching Show Harrogate"
Love the dress. It looks great. Hope the Sewing Bee comes back soon. My mum always zig zagged the inside seams, it was years before I realised there were other options. I love this on you, it looks fab. Perfect with boots and a cardie in the cold weather but it’ll be gorgeous in the spring / summer too.